It seems that I'm living through a popular revival or at least a fairly popular reworking of second-wave feminism - and theatre and the performaning arts is in no way behind the door or outside of this trend. The Three Minute Theatre in Manchester's Northern Quarter is giving special focus to female artists this year. And so it is quite fitting for 3MT to invite Sarah Wilkinson of Stone Jetty Productions to present her own production of Female Transport, written by Steve Gooch and first performed at the Half Moon Theatre, London in November 1973, marking its 40th anniversary. Female Transport is set in the harsh times of 1807 on a convict ship, and focusses on six women convicts - Winnie, Madge, Pitty, Charlotte, Nance and Sarah as they are transported to work camps in Australia, brutally managed by their imposing jailer Sarge (Nick Cornwall). Obviously little in life is ever only one thing or another, but there are a variety of odd tensions in this script that seem to be unhelpfully contradictory, reflecting the use of a historical setting to shoe-horn a political line into each scene, rather than develop a historical piece that may offer insights into the here and now. The most awkward aspect of the script which imposes the biggest burden on the actors and director is the central proposition of the story - that the experience of women being incarcerated on a prison ship in 1807 can be used to promote the social and political solidarity of women in contemporary society. This I found odd and distracting for what could have been an historical piece in its own right. The hopeful politics of solidarity coming out of a structurally common experience of oppression and repression, is in truth bourne out of a failure of ideologically developing of campaigning programme of action to unite behind a common cause. The play was written in just such a historical context where the civil rights campaigns, left wing upsurge and womens movements of the sixties were in decline, the pound had recently been devalued and Harold Wilson's economy "burning with the white heat of technology" seemed a distant memory as Ted Heath was taking on the miners. 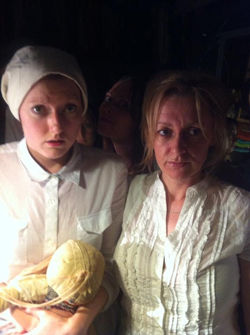 Bring on Steve Gooch's six women convicts as they imagine the harrowing six-month journey that lies in wait for them. The banter of the women did have the feel of patronisingly informing the audience of life aboard transport ships, with potential scurvy and so on, more than it being a more fluid dialogue of characters facing up to their ordeal. The wider context of the prison ship trade was awkwardly delivered by the ship's Surgeon to be (Jez Smith) who lectures the women on the fact that he disagreed with the morality of the trade before accepting the Captain's coin. Jez Smith does a great job of being the middle man, reliant on the ship's practical and business minded Captain (Mark Hill), and the seen-it-all bruiser Sarge (Nick Cornwall). Nick was truly imposing in this role from the reception he gave the audience upon our arrival, the laying the law down to the women, the deal he stitched up with the Captain behind the Surgeon's back, to the end where no quarter was given. To say the stage was minimally dressed and brutal with its straw on the floor, thin mattresses shared by three to a bed and pillows filled with straw probably overdresses it, so the six women must have hated this production. The effect for the audience though was palpable as we saw them thrown to the floor after punishment beatings. And the stir crazy crammed space gave an overbearing sense of the brutality of life on the prison ship and a sense of what awaited them in the promised land. I thought all the women worked well to establish the pecking order, rules and codes they should abide by to get through the experience, often in the face of constant meddling and divisive picking off of weaknesses by Sarge for example, who recruits the soft-hearted Winnie as the cell's trustee or 'Matron'. The new boy Tommy (Luther Alexander) who is trying to learn the ropes, get into a right of muddle as the women run rings round him, taunting him like a cat plays with a mouse. Stepping down from the clunky bigger picture of the script of promoting women's solidarity through a shared experience of oppression and repression, the interchanges between the women were a complete giggle, with some fabulously sharp and dark one-liners. Madge (Yvette Warburton), Pitty (Lynn Cunningham), Charlotte (Lynsey McVey), Nance (Mia Vore), Winnie (Amy Quesne) and Sarah (Chloe Jones) share the lead equally. If the journey doesn't kill them first, then Suicide awaits - a very contemporary preoccupation and wonder if that contributes to the interest in reviving the script. Sarge also exploits his positon by coming on to Charlotte, a brash pickpocket, whose best friend Sarah, another pickpocket, is prone to sea-sickness but manages to find some solace with innocent cabin-boy Tommy; while political agitator Nance is stuffed into a barrel, beaten and finally flogged as a punishment for repeated disobedience. Meanwhile the older Madge's motives in cultivating the affections of hapless innocent Pitty are the subject of much suspicion, and up on deck the Surgeon is having a tough time with the Captain insisting on hygienic and human conditions for their increasingly restless cargo.